I am fairly new to fishing for Northern Pike. I have taken a couple guided trips where we trolled for them, using large baits. I use guided trips to learn as much as possible, and to flatten my learning curve. I believe in asking as many questions during the trip that I can, in order to apply what I learn later. Both of these trips were fun and we caught fish. Some of the things I learned was that steel leaders are not necessary and may even frighten off fish. I also learned the most important thing is to keep pressure on the fish, don?t ever pump the rod, it can give a fish an opportunity to escape if the line gets slack at all. Lastly, when fishing with planer boards don?t be surprised if your largest fish come on the boards farthest out. Since those trips, I have gone a few times on my own. I have caught a few small, hammer handle, pike but have not had the success I had with the guide. I normally start out casting then switch to trolling then go home maybe catching one or two small fish for the day. I have also violated my own rule, in that I haven?t applied what I?ve learned. Starting out life as a rainbow trout fisherman, I think I?m a little intimidated by the large baits. 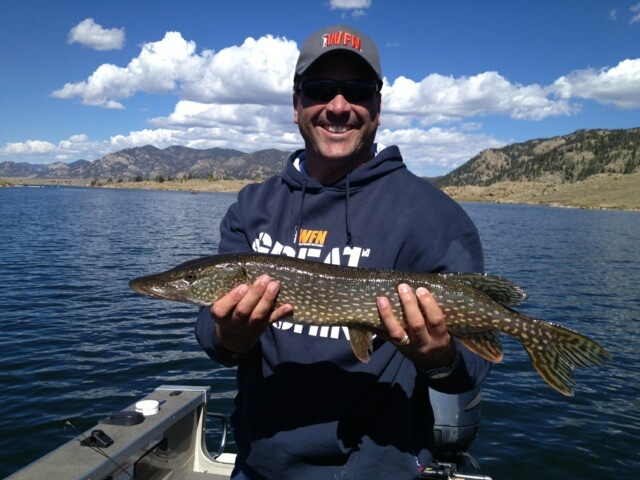 My regular fishing partner, Johnny, and I headed down to Eleven Mile Reservoir for the day. We had my boat in tow and were dreaming of monsters with huge teeth. On the way down we were talking about techniques. He had heard the hot lure was a Storm Rainbow Trout retrieved slowly, I think we both knew that we would try that lure then switch right away if not successful. We got to the lake and launched as quick as we could. The lake was like glass, which I have heard both from guides and WFN is bad for pike, because the boat tends to spook the fish. So we got to Witcher?s Cove and started to cast. I threw and threw and threw that bait. I had several followers and so did Johnny, but we just couldn?t find any takers. We changed baits a few times, but never threw anything smaller than a Mepps #5. We made our way along the shore and toward the dam, but no luck. We decided that we would try the other side of the lake, and I went back to the Storm Rainbow Trout. This lure is so big that I makes a god sized splash when it hits the surface. I know it was annoying other anglers because we could see them talking and looking our way with disgust. I was starting to feel the pressure, when all of a sudden wham! I got a good strike and fought the fish to the boat. It was a good start about 18 inches long. The people around us were still not happy about the splashes but they were more tolerant now that we boated a fish. We fished this area for another hour or so and decided to head back to Witcher?s . There were two boats in the cove and we took up some property and started to cast. The splashes started and so did the looks. After three casts, I got hit again and this fish meant business. It ran and pulled drag, shook it?s head and pulled. When I got it to the side of the boat, I saw the largest pike I have caught to date. It was 28 inches long and weighed almost 5 pounds. After the high fives and excitement, Johnny and I kept after them in the cove. Johnny had a taker but missed the hook set, then he had a great follower that took off as soon as the boat came into view. When we arrived at the dock, we spoke to some other anglers. No one had any better success than we had that day. The fish just weren?t all that active. I learned an relearned a few things; don?t be afraid of the large baits. The bait I was throwing is about six inches long and weighs a few ounces. I also threw a Mepps Giant Killer. I learned to keep going no matter how slow the action is. Of course I knew that already, but this trip reinforced that. I bet we made 2000 casts that day and my arms felt every one of them by the end of the trip. Johnny and I agreed that this was a great trip. I am proud of that pike mostly because the lessons I learned will lead to even bigger ones in the future. If you are new to a type of fishing or species of fish, listen to the more experienced guys and follow their direction, no matter how uncomfortable it is at first. I would bet that it will increase your success like it did mine.